Is H&F Council’s Housing Consultation A Done Deal? I didn’t think giving people a vote would be considered a controversial matter but at the Select Committee on Tuesday, 14th September the Conservatives refused to do it. Instead, they said a consultation will suffice. The issue requiring a vote concerned the future management of all the council homes in the Borough. It’s reasonable to ask why? The answer being eighty eight per cent of council tenants and seventy seven per cent of leaseholders had only recently voted to transfer the management of their homes to a resident led arms length management board - as you can read on H&F Council’s website. Given the scale of the democratic mandate for this change it’s hard to not to see how another vote is needed to transfer it back. The last vote was managed by the independent Electoral Reform Society. But this time, Cllr. Lucy Ivimy, the Cabinet Member for Housing, argued that a marketing company’s consultation would be enough. 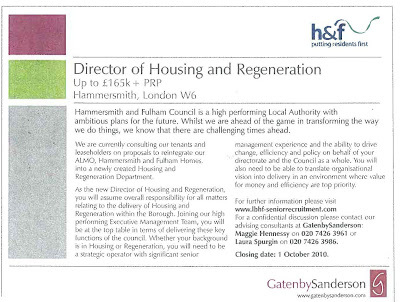 Meanwhile, the attached advert for a new housing director appeared in the Sunday Times just two days earlier. 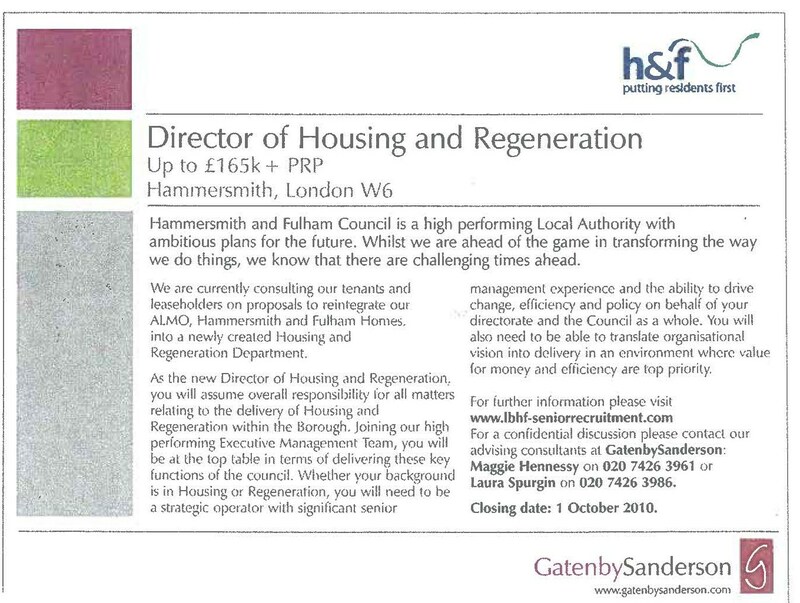 This is a new post being advertised but it assumes there will be a direct housing management role – a role which is forbidden by the current arms length structure. So it’s not difficult to see how this Conservative Administration is, at the very least, confident that this “consultation” will produce “the right result”. Cllr. Ivimy argued that this consultation is in fact a vote. But take a look at the attached page (Click on it to enlarge) from the Conservatives’ consultation. It does not look anything like any ballot paper I’ve ever seen before and that is only one of the many pages in their “consultation”. In fact, H&F Council have used a cynical psychological ploy that will allow them to count a 'Yes' vote if the resident ticks any of the first 3 of the 5 boxes on Q1. Imagine the outrage if this technique was used to decide the outcome of any real elections - either here or abroad. It is not unknown for public bodies to go through the motions when “consulting”. Given this Conservative Administration’s highly controversial plans to knock down a quarter of all Council housing then it’s not hard to see why they want it all back in house as it would greatly smooth out this process. The Opposition require a review of this consultation and methodoloy before we say we are in any way satisfied with its validity. At the last elections my fellow Labour councillors and I campaigned for a different approach to managing our council housing. One that would have devolved more powers to residents on a much more local basis. But, like last time, we would have given all residents a vote. It is a concern that this Administration will not do that and given everything else they have said and done with social housing it’s hard to trust that they have the best interest of our current residents at heart. “There are going to be real failures of delivery. Heart attacks not dealt with, hernias won’t be fixed, hip replacements won’t happen, and psychological care will not be given." So said Dr. Tony Grewal, on the 14th September. He was representing Hammersmith and Fulham’s Local Medical Committee (LMC) at the Borough's Housing, Health and Adult Social Care Select Committee. Dr. Grewal made the controversial comments during his opening statement about the Coalition Government’s health re-organisation plans detailed on item 5 on this agenda. I twice repeated them back to him to be sure I correctly had taken down what he said. He confirmed that I had. Dr. Grewal diplomatically agreed that it was politics that decided the future of the NHS but said “we can’t go out and change the votes of hundreds of thousands of people so I want to see how to make the government’s plans work as I have to do the best by my patients”. By now we were none the wiser as to why the government’s actions would produce such failures in the our health care. Earlier in the meeting, James Reilly (H&F Council’s Director of Health and Adult Social Care) had responded to questions about the level of objective analysis and evidence base for the government’s claim that its 36% cut to NHS commissioning and support is just “cutting waste”. He said “There isn’t any… and there is therefore risk”. Adding that the approach to this cut was based on a “pretty crude application”. Dr. Grewal later said he would “refute any notion” that it was the government’s reorganisation plans that would bring about “heart attacks not dealt with…” etc. Was it therefore a lack of funding or what? The Chair was keen to cut all further questioning on what was proving to be an embarrassing matter for the Conservative led government. By the end of the meeting it was apparent that these changes are being rushed through; that there is a weak approach to managing the evident risk of failure and that the Government's proposals appear to be based on virtually no objective analysis of what the problems are. Given the dangers we had been told about, I called for the Select Committee to write a non-party political letter to Andrew Lansley MP (Con) - the Health Secretary. I argued that we had a duty to pass on our concerns and do all we can to avoid any failures in local health care. The Tories used their majority to vote this proposal down. 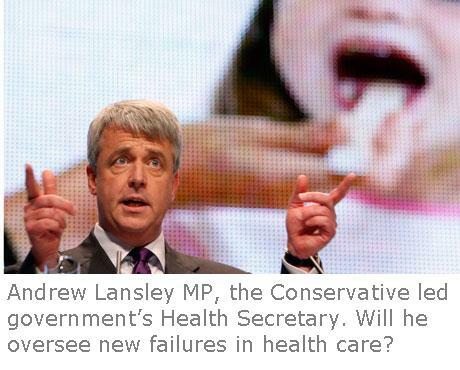 The Labour Opposition will therefore write to Mr. Lansley and we’ll let you know when we get a reply. Meanwhile, if you’d like to read the coalition government’s proposed changes then please click here. 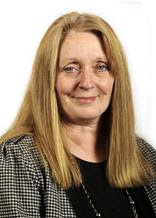 North End Councillor: "Many Residents Will Be Left Without A Hope Of Staying In This Wonderful Community"
Councillor Daryl Brown (Lab), the newly elected representative for North End ward gave her maiden speech in Hammersmith Town Hall last night. North End is a highly political ward - not least because of the Conservatives' proposed police cuts and plans to demolish 800 affordable homes for people on low incomes. I would like to begin by thanking the people of North End ward for voting for me on May 6th. It was a hard fought campaign. I worked with a fantastic team with Max Schmid and Matt Turmaine. It is an honour to be an elected representative and I am only sorry that, this time, Max and Matt are not also here with me on these Labour benches. I would like to also recognise the contribution of Caroline Ffisk who lost her seat in the same local election. I didn’t know her. Undoubtedly, I disagree with much of the programme she actively supported. But politics aside, I thank her for the work she did and wish her well with her young family. I also offer my congratulations to fellow newly elected North End ward Councillors Georgie Cooney and Tom Crofts. North End is a mixed ward. People living side-by-side and at the same time living very different lives, with very different incomes, very different life experiences, different opportunities and different fears. There are a large number of people in private rented accomodation. More in our social housing communities on Cheeseman’s Terrace, the West Kensington Estate and Gibbs Green - to name but a few. Walk down the leafy streets of Fairholm, Charlville or Turnville Roads and resident parking permits sit in the widows of shiny cars costing over £60,000 and houses are valued at over £1 million. Stroll through the streets of North End on any busy morning: There are elderly ladies queuing at bus stops; excited children running to the newly refurbished Normancroft school; people carrying fresh fruit and vegetables back from North End Market; business women rushing for the tube and people enjoying the much improved Normand Park – thanks to Labour’s New Deal for Communities. Come to my ward and you will get a feel and a flavour of this wonderful, mixed part of London and see a neighbourhood that truly works. So it is apt that, given all this, I should use my maiden speech to talk about the Local Development Framework. Not only does this document carry this Administration’s vision for this vibrant community. It makes a number of detailed assertions on how this area should change. On page 98, you will note that much of North End ward is placed in the North Fulham Regeneration Area. And the Administration asserts that “this area has the potential to become a major new neighbourhood for the Borough”. The word “new” causes concern for many of my constituents as they, clearly, are part of the present neighbourhood and they wonder what will happen to them as their Council seeks something different - evidently viewing them as part of the old. While there is a nod to the importance of the North End market in this paper, it is a concern that this Council wants to “relocate it”. This facility that provides value, freshness and vitality to the people of Fulham is left with its future hanging in the balance. The LDF criticises the lack of services but does not mention the closure of Baron’s Court Library. On page 99 the Administration seems to have toned down its comments on social housing. Gone is the talk of “ghettos” and “barracks for the poor”. But the sentiment remains familiar, with talk of council estates being “poorly laid out” and going on to complain that there are “high levels of social rented housing” – which it links to the (and I quote) “social, economic and physical deprivation in the area”. The Administration’s plans for social housing in North End ward are a particular concern. Residents groups have campaigned. There has been national media coverage and over 80% of residents on the West Ken and Gibbs Green Estates said they were happy with their neighbourhood. And yet, despite all this, the Administration is unable to allay people’s fears about demolitions and cuts to social rented housing. Instead, it simply says that quantity of “social housing should not be reduced”. There is no binding guarantee of the levels of “affordable rented housing”. If we look at what this Administration already does we can only conclude that many residents will be left without a hope of staying in this wonderful community - as they will only be offered shared ownership schemes well beyond their financial reach. Reading through this document it is apparent that this Administration does not share the affection or recognise the strengths that many people, including me, have for North End ward. They want to change it so that it is new. This document puts a light coat of gloss on proposals that will be to the detriment of a lot of my constituents. The only glimmer of hope in this LDF is that it says many of the plans will be phased in over the next twenty years. Well, as the plans unfold, this year and next, I state now that we will support those proposals that benefit the people of this ward and I will vigorously oppose those that end their rights, increase their cost and threaten their homes. But the only real security can come from an Administration that appreciates the strengths of this amazing mixed community. That can only be a Labour Administration. And that’s why I give notice that we will campaign to take all the seats in North End and win back the Council. Only then can we deliver the security, fairness and decency the people of my ward deserve."